On July 1, 2015 Oahu joins the other Hawaiian Islands by prohibiting single-use plastic bags, effectively banning disposable plastic bags throughout the archipelago. Bag bans have gained a lot of support in Hawaii since they preserve the natural beauty of the land and water, and reduce the negative environmental impact caused by plastic bags. As The Children’s Miracle Network has learned, single-use bag bans can also do a lot more to help the environment, they can help the people too. There are so many advantages to going reusable instead of using plastic bag after plastic bag for such a short time before tossing it into the landfill, if it makes it, never to break down. Going reusable instead of going single-use means less litter and therefore fewer resources, both financial and time, spent cleaning up the mess. This means tax money can be better spent on improvements, instead of picking up plastic bag litter. The cost savings associated with pollution control is actually a big factor when cities and states consider bag bans. Less discarded trash also eliminates the risk plastic bag litter poses to animals and their habitats. When animals mistake plastic litter for food or become tangled in the thin film it can lead to death and possibly cause irreparable damage to the food chain. Tourism is a major industry for Hawaii, so while preserving the environment is definitely worthwhile for the people and animals who call these islands home, there are financial benefits in the form of tourists visiting the islands that make banning disposable plastic bags a smart move. It turns out disposable plastic bag bans benefit the environment, wildlife and people. Union League (HCUL) has proven as much. 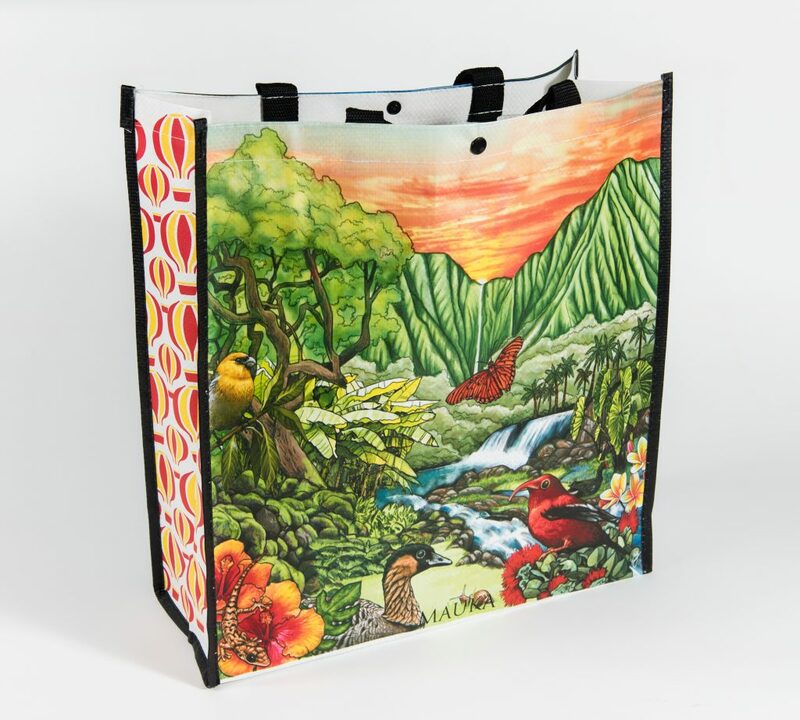 The Hawaii Credit Union League (HCUL) has started selling reusable shopping bags, in full color with with custom illustrations to raise awareness and benefit the Kapiolani Medical Center for Women and Children through its Kapiolani Children’s Miracle Network. Since 1998 the HCUL has raised over $750,000, but in renewed efforts selling reusable bags beginning in the fall of 2013 nearly $140,000 has been raised to support Hawaii’s only pediatric intensive care hospital. Certainly people are buying the bags to support a worthy cause, but the bag ban makes reusable bags more in demand. The HCUL wisely identified the need created by the disposable bag ban and saw this as an opportunity to help a couple worthwhile causes in one fell swoop. Disposable plastic bag bans and Bag fees create a need for reusable shopping bags, and this is a great way for a company or organization to get the word out about their brand while also helping residents adjust to the ban. When a bag ban comes into town, it not only helps wildlife, the environment and offers the opportunity for lower taxes due to the savings seen in pollution control, it also offers the perfect opportunity to market your brand and even to partner with a non-profit to raise awareness and funds for a great cause.